The Times-Journal, and this corner in particular, championed “Ma Ferguson” as she was known for many years by Toronto lawyers. The photo on the front page of Friday’s T-J offers a tantalizing taste of the individual who served as the first woman alderman in St. Thomas; to initiate a Red Cross Clinic in Guelph; and to be appointed the first Division Court judge in Ontario (later to become the Small Claims Court). St. Thomas native and Order of Canada recepient Edra Ferguson, left, and Tara Muzumdar, the Belmont House Nursing Home employee who nominated her. We will forever cherish the personal note from Edra’s nephew, St. Thomas lawyer John Sanders, sent this past June after the announcement she was to receive the Order of Canada for her contributions in the fields of law and women’s rights — the oldest person ever to receive the Order of Canada. Better yet, today’s (Saturday, Nov. 19, 2011) Bygones photo on page 2, sent along by Gina Coady at Elgin County Archives, transports us back to 1926 and a striking Edra as a member of the Alma College debating team. Built heritage wasn’t even on the radar at the onset of the Oct 25 municipal election campaign in St. Thomas. Certainly not a lot of candidate literature went into any detail on preserving the city’s heritage and it was a non-starter in the Chamber of Commerce member survey found here. By the final weekend of the campaign, with full revelation of the $3 million lawsuit filed against the city, Mayor Cliff Barwick and others by developer David McGee, details here, heritage may have proved to be a critical factor in the final outcome. It was a game-breaker. It, being news that broke last Thursday of the law suit by London developer David McGee, filed in August, against the city, Mayor Cliff Barwick and numerous other defendants. Did the timing of the $3 million suit, and the hiring of political strategist Suzanne Van Bommel, impact the mayoral vote in the final weekend of the campaign? A study of the advance polling numbers would appear to indicate the front-page story filed one week ago by the T-J’s Kyle Rea, and picked up by the Free Press in London, took the wind out of Barwick’s campaign sail. As of last Friday, Barwick led the advance polls with 585 votes, followed by Heather Jackson-Chapman at 454 and Al Riddell with 432 votes. 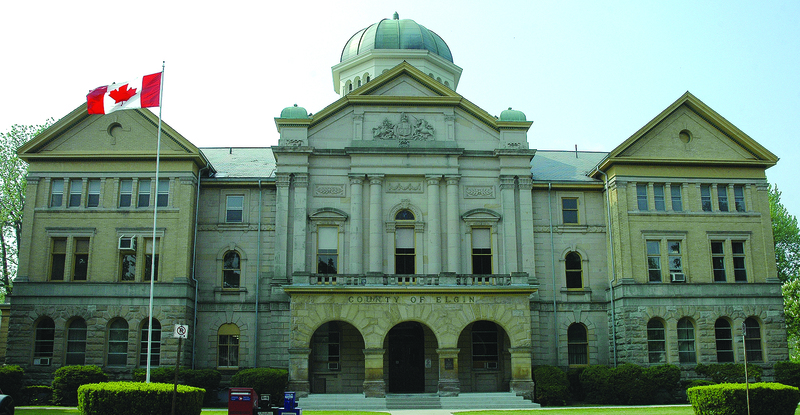 Members of the St. Thomas-Elgin branch of the Architectural Conservancy of Ontario applaud the decision to preserve the historic Elgin County Courthouse by consolidating the Ontario Court of Justice and the Superior Court of Justice under one roof. The decision illustrates that heritage conservation is fully compatible with modern requirements. The city and county get a modern, fully accessible courthouse facility that will create short and long term jobs located in the heart of downtown. ACO branch members believe that the project will have additional spin-off benefits, spurring further development in the west end of the city. It will also act as a model for other creative re-uses of the city’s many heritage properties. The St. Thomas-Elgin Branch of ACO was formed in April of this year in response to the devastating loss of historic Alma College due to neglect and arson. The Architctural Conservancy of Ontario was formed in 1933 with the express purpose to “preserve buildings and structures of architectural merit”.